RECTANGULAR TRAY These products are made of PS (Polystyrene), PP (Polypropylene) & PET (Polyethylene Terephthalate) virgin food grade material by Thermoforming & Vacuum forming processes. These products are used for packing food like biryani, chowmein, fruit salad, vegetable salad, etc.These containers are also called food packing box. 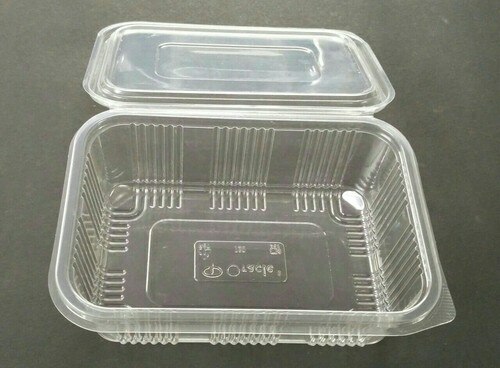 RECTANGULAR HINGED CONTAINER These products are made of PS (Polystyrene), PP (Polypropylene) & PET (Polyethylene Terephthalate) virgin food grade material by Thermoforming & Vacuum forming processes. These products are used for packing food like salad, fruits,etc. . These containers are also called fruit packing box. BURGER BOX These products are made of PS (Polystyrene), PP (Polypropylene) & PET (Polyethylene Terephthalate) virgin food grade material by Thermoforming & Vacuum forming processes. These products are used for Packing burger that is why it is called burger box. Prominent & Leading Manufacturer from Delhi, we offer 200 ml disposable glass, pet disposable glass, disposable glass, double wall disposable paper glass, printed disposable glass and plastic disposable glass. PET GLASS These products are made of PS (Polystyrene), PP (Polypropylene) & PET (Polyethylene Terephthalate) virgin food grade material by Thermoforming & Vacuum forming processes. These glasses are used for shakes, juice, cold drinks, lassi, nimboo pani, badam milk etc.